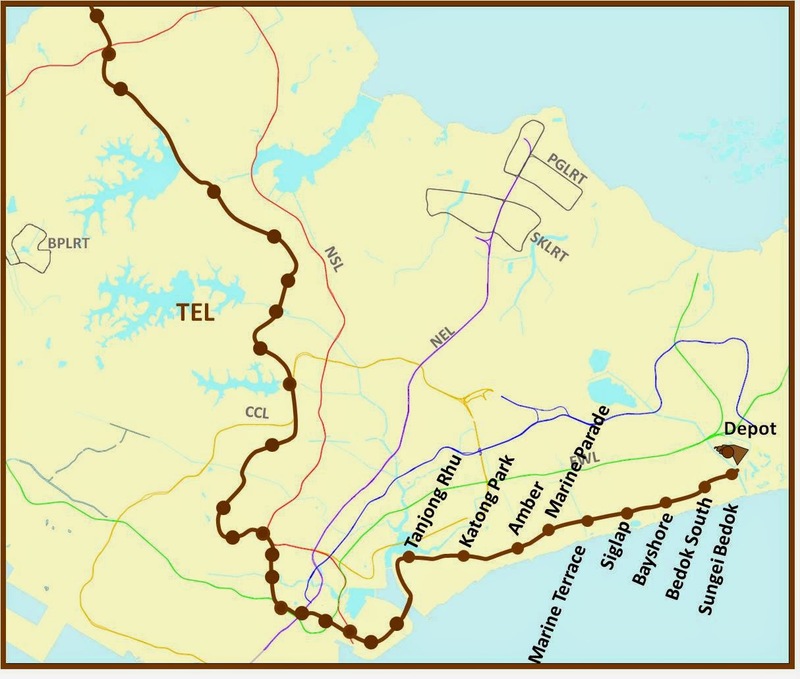 According to a report in Lianhe Zaobao today, market analysts said that several residential developments along the newly announced Thomson-East Coast Line (TEL) may see higher potentials for collective sales. However, developers are unlikely to move on these till 2017 at least. These developments, which are freehold, include AmberPoint and Parkway Apartments (near Amber MRT station) and Katong Park and Equatorial Apartments (near Katong Park MRT station). All are more than 20 years old and given their smaller plot areas, may be "bite-size" enough to raise developers' interests. But with current depressed market, the climate for en bloc sales is less than rosy given the big disparity in price expectations between seller and buyer. A report published last week by Colliers International has indicated that during the 2010 - 11 en bloc "peak" period, a total of 78 collective sales were concluded. However, the numbers have been falling since, with only 22 sales concluded in 2012. And up to July of this year, there was no en bloc transaction made in 2014. The failure rate of collective sales have correspondingly been increasing over the last 2 - 3 years. This was 67% in 2013, up from 61% in 2012. Developers have generally been partial towards acquiring new land sites via Government Land Sales (GLS), while keeping their options opened on en bloc sites. However, analysts expect that developers may become more active in the en bloc market come 2017, which is 6 years before the scheduled completion of the TEL in 2023. And older developments that are 20 years or older and having less than 200 units each, in areas such as Amber Road, Katong, Marine Parade and Siglap will be especially in their radars, given the smaller purchase quantum and corresponding lower risks. Laguna Park (near to Siglap MRT station), a 99-year leasehold development with 63 years left on its lease. The last en bloc attempt was in October 2011, where the asking price was $1.25 billion, equivalent to $954psf ppr. Hawaii Tower (near to Amber MRT station), a freehold development that last attempted to en bloc in 2011 as well with an asking price of $700 million. So with the announcement of the TEL and location of its MRT stations, these two developments may now stand a better chance of finding buyers. Collective sales aside, the TEL may also provide a new lease of life for new projects with unsold units that are currently under construction. As of Q2 2014, new projects launched along the TEL included The Meyerise - a 239-unit freehold development, of which 101 units are sold, and Amber Skye - a 109-unit freehold project with majority of units unsold. Costa Rhu - a 99-year leasehold project that will be 19 years old come 2017. It is located at the very end of Tanjong Rhu and nearest to the Marina Bay and Gardens by the Bay. Pebble Bay - a 99-year leasehold project that will be 20 years old come 2017. It is situated along the KallangRiver Basin and has excellent view of the area around the Sports Hub. Park Shore - this is the only freehold projects around the area and will be more than 20 years old come 2017. Given its smaller plot size/number of units compared to Costa Rhu (737 units) or Pebble Bay (510 units), Park Shore (152 units) probably has the best potential for collective sale amongst the three. No Comment to " TEL may boost collective sales in East Coast! "